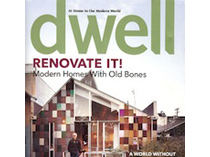 Step into the pages of Dwell. We gave our editors free rein to create the ultimate design event. The editors of Dwell are bringing a four-day celebration and exploration of modern design to LA. Over 50 cutting-edge designers, architects, legislators, and activists are signed up and ready to empty their heads at the two-day conference. And, at the exhibition, you’ll experience 55,000 square feet of ideas including a prefab neighborhood completely furnished and landscaped by Dwell. CONFERENCE Join the Dwell editorial staff and over 50 of the most influential minds in design such as Lorcan O’Herlihy, Michelle Kaufmann, Mark Rios and Lori Dennis-the people who are moving and shaking the industry. EXHIBITION Visit 200+ exhibits, a prefab extravaganza plus landscaping, architects, designers and their products. HOME TOURS We’ve set aside Saturday for single-family homes on the Westside and Sunday for urban dwellings downtown. TRADE DAY Conference attendees and trade professionals get their own day to roam free at the exhibition. We’ll let you in on Friday before it opens to the general public. AFTER HOURS Have cocktails and mind meld with our presenters, Dwell editors and your design buddies. Check dwellondesign.com for complete details. 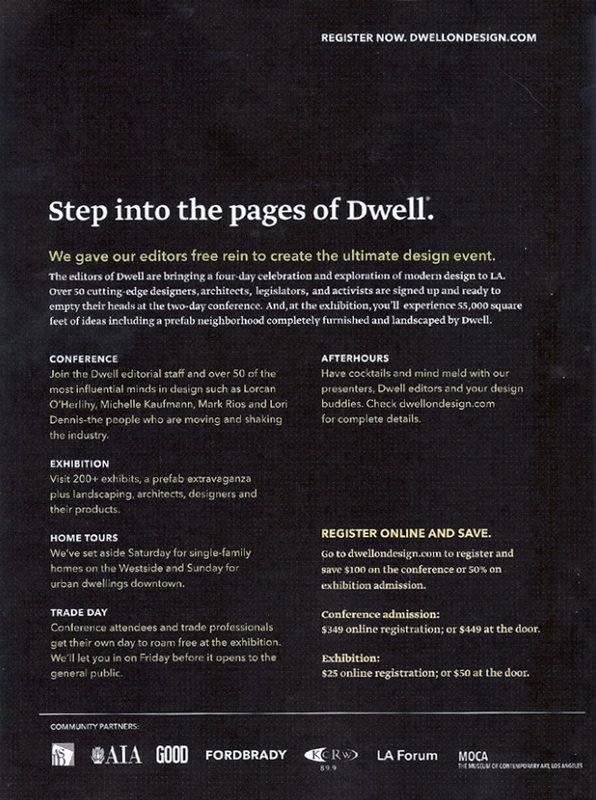 Go to dwellondesign.com to register and save $100 on the conference or 50% on exhibition admission. Conference admission: $349 online registration; or $449 at the door. Exhibition: $25 online registration; or $50 at the door.